What’s a Day like in Rehab? How Does Outpatient Treatment Vary? According to the Substance Abuse and Mental Health Services Administration, more than 20 million people were in need of substance abuse treatment in 2015. Rehabilitation is a carefully crafted process that gives people suffering from addiction their best chance to manage their disorder on a long-term basis. Residential or inpatient rehab is a form of addiction treatment that provides clients with 24-hour care under the supervision of professionals. Due to the comprehensive nature of the care provided, residential rehab is often recommended for cases of severe or long-term addiction, and for those suffering from co-occurring disorders. Outpatient rehab may provide similar therapies to those provided in inpatient rehab, but clients return home after treatment each day. There are also different levels of outpatient rehab, ranging from programs that meet once or twice per week to intensive outpatient programs that involve six hours per day of therapy. According to the National Institute on Drug Abuse (NIDA), addiction treatment should last at least 90 days to be effective, though the entirety of this period does not need to be spent in an inpatient rehab facility. Oftentimes, clients may begin with a month or so of inpatient rehab and then transition to an outpatient program for the remainder of their time in structured treatment. 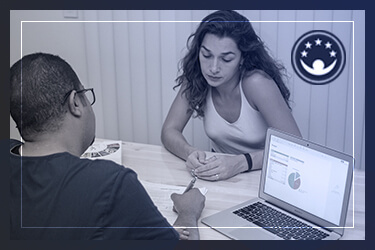 Specific schedules will vary from program to program and according to individual client needs, but there are some consistencies between most addiction treatment programs. With this information, incoming clients can have an idea of what to expect from an average day in rehab. Life in rehab is very structured. 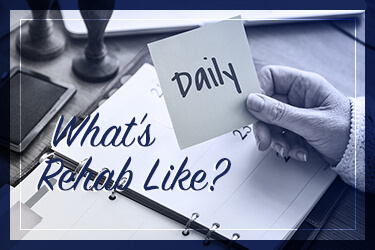 Each day is filled with activities and therapies to eliminate boredom and downtime during which clients may be tempted to relapse to drug or alcohol use. By learning a new way to live with a new schedule, a person can avoid reverting to old tendencies that could threaten their recovery. Strict structure can also distract clients from any cravings they may experience related to their drug of choice. In rehab, there is some personal time available between meals, activities, and therapy sessions, but much of the day is planned out for clients. The day often begins early in the morning, with a set wakeup time of 7 a.m. Nurses may administer medications first thing in the morning, and there may be some private time for clients to get ready for the day. Time may be set aside for yoga or meditation, as their calming benefits can set the tone for a day in a rehab setting. Breakfast occurs at a set time each day, often around 8 a.m. Clients eat together in a communal setting, helping to foster relationships that are formed in rehab. Some type of therapy often follows breakfast. The first session of the day may be individual therapy where clients meet one on one with a therapist. These sessions range in length from 45-90 minutes. Many therapists use Cognitive Behavioral Therapy (CBT), which has seen success in the treatment of addiction, according to NIDA. CBT helps clients correct problematic behaviors that led to their substance abuse by addressing the thought patterns underlying the behavior. By anticipating triggers for relapse that may arise during recovery, clients can devise strategies to address these triggers, helping them to avoid a return to drug use. One of the major strengths of CBT is that it has been found to be effective even after clients leave treatment, thus teaching them retainable skills to assist in long-term recovery. After a morning therapy session, there may be scheduled time for a specific activity or personal time. During this time, clients may participate in a group fitness class, walks around the grounds, or take the time to journal. Lunch typically takes place around noon, and again, clients eat together in a group setting. Lunch is commonly followed by an afternoon therapy session. If individual therapy took place in the morning, the afternoon session may consist of group therapy. This involves one or two therapists leading a group of clients through the session. Clients who are dealing with similar issues are generally grouped together, providing an opportunity for them to learn from each other’s experiences and support each other in the recovery process. After a brief break following group therapy, clients may participate in a complementary or alternative therapy, such as art therapy, music therapy, equine-assisted therapy, or adventure therapy. These forms of therapy are often fun for clients, helping them to express themselves creatively or try a new activity. By learning new skills or exploring new things, clients may build renewed self-confidence and acquire a better understanding of themselves. Dinner typically takes place around 6 p.m., and it may be followed by a group discussion or 12-Step meeting. Clients may then enjoy some downtime before bed when they can journal, read, or meditate. Most rehab facilities have a set “lights out” time, as restful sleep is vital to recovery. While most days at rehab will follow a similar schedule, there may be special activities or events throughout the week that will alter the schedule. For example, special events may be held on family visitation days or a group of more seasoned clients may take an off-site visit for a particular type of therapy or activity. The schedule of intensive outpatient programs may resemble that of an inpatient program, just on a shortened time schedule. For example, clients may show up to treatment around 10 a.m. and begin with an individual therapy session. After lunch, they may participate in group therapy followed by a complementary therapy. After that point, they return home for the day. In intensive outpatient treatment, clients will often meet at least three days per week for several hours at a time. Partial hospitalization programs usually require that clients spend 4-6 hours per day in treatment for 3-5 days per week. Less intensive forms of outpatient treatment may only require a few hours of care per week. Since clients continue to live at home during outpatient treatment, a good portion of therapy may be dedicated to addressing temptations faced in the outside world. It’s imperative that clients have a strong support system at home and a substance-free home environment in order to thrive in outpatient addiction treatment.